They caution multiple times that, because of the dynamic nature of the technology, prices are falling rapidly. Still, it’s nice to see real figures, even just ballparks. As you know if you’ve read one of my earlier 3D rants, I don’t buy into the notion that only certain content looks good in stereoscopic (i.e. action movies & nature documentaries). I don’t think filmmakers should limit themselves. The use of color can add to an indie drama, so why can’t screen depth? Even documentaries comprised of mostly archival footage might still gain from having interviews or re-enactments shot in 3D. As part one of the article notes, “3D channels face an acute shortage of content.” Hollywood only has about 20 movies in 3D in the pipeline, because there are only so many 3D-ready theaters to show them at. But the cable networks which are moving to 3D need hours and hours to fill. I’ll add that since the Clash of the Titans upconversion test, we can assume for now that audiences don’t know or care about the difference between 3D captured in camera and the “fake 3D” of upconversion, even poorly-executed upconversion. But everyone who is planning a movie now needs to seriously consider how much further the market will be in terms 3D by the time that movie is finished. Shooting true 3D now may make all the difference down the line. 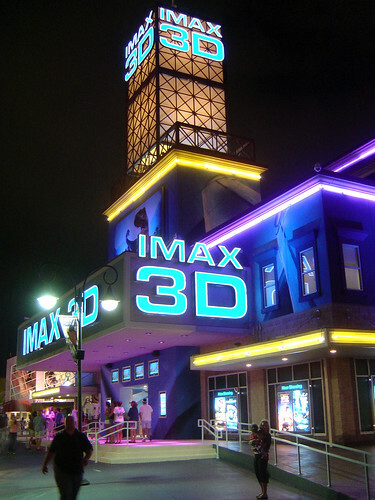 IMAX 3D by Flickr user laffy4k used under Creative Commons Attribution 2.0.